All in all, it was a good performance at Buckmore Park. We showed we've got the pace to be right up the front of the field and, apart from some small problems, we would have been. I can't be bothered to repeat someone else's work, so below is the press release we issued for the Club 100 report. Somehow new team member Peter O'Connor dragged the thing round to 4th in qualifying, leaving Dan Gore to make (in his own words) an absolutely dreadful start. He was still in the leading snake of karts though, until he was black flagged, apparently for hitting an invisible cone. This lost us over a lap and put us back to 31st. Thanks to some quick and aggressive driving from Simon Young, and seemingly everyone falling off at the start of the second hour (Dan spent 2 laps behind a back marker waiting for a corner without yellow flags), we were back in 6th with 20 mins to go. This left Peter with one stint during which to make up half a lap on Piston Broke, which he managed with a few laps to spare, justifying his new place as team ringer. With a pit-stop technique refined through previous years in Club 100’s British Universities Karting Championship, this should be a good season for RBB, so long as we can avoid both the kart we had at round 1 and those tricky phantom cones. I posted yesterday about RBB Economics Racing's attack on the Club 100 Intermediate championship. Here's a rundown of the team's three drivers. Dan works for RBB Economics; his company is sponsoring the team's efforts this year to a modest degree, hence our team name. I met Dan three years ago – he was at Warwick on a one-year postgraduate course in 2002/03 and raced in the BUKC on a couple of occasions. Since then, Dan has done a few Club 100 events, including a full season with Club 100 (in their now-dead City Challenge championship). Two of those races were with me as his team-mate: we came second and fifth, the former being his best result towards an overall third place. The winners of that year's championship are now racing in the Premier class. Dan's probably a tenth or two per lap quicker than me around most circuits, but not always as keen to take a risk in traffic. It kind of balances out. I got to know Pete through BUKC too: he captained Kingston's uni team last year. Kingston had a reputation within the championship for being a bit nuts, very fun-loving, and always up for a laugh. That said, they had some very quick drivers, Pete included. Pete nearly won his first BUKC sprint race the same day I did, but ended up winning a couple of weeks later - although perhaps it should have been me that race again! I'm not sure exactly what level of experience Pete has, but I know he's also done a fair bit of racing in twin-engine prokarts. This has included a couple of Kingston's races at the legendary 24 hour race held at Spa-Francorchamps' kart track, and some other successes too. Pete's definitely our quickest and most consistent driver, even if it wasn't him who set the best time at our recent test session. And then there's me! Not really having done any racing before uni, I found myself to be quick in indoor karts (helped by my low weight) and in outdoor prokarts etc, including a good showing at the 2003 Varsity prokart meeting. This wasn't reflected in my early Club 100 experience though: 8 seconds off the pace at a cold and damp test day at Buckmore, and several spins in both my races of the 2003 season. 2004 started with a race alongside Dan (mentioned above) and a good second place against Loughborough's finest at a pre-BUKC event. My four BUKC rounds that year were still poor, with no top-10 finishes and a few more spins, but my pace was improving – thanks in part to buying my own helmet and a seat insert which stopped me being thrown around when cornering, dramatically improving my "feel" for what the kart was doing. 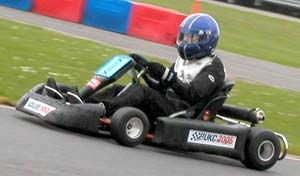 The '05 BUKC season saw me up another three steps in terms of pace. I won a race and was a regular A-team driver. I also helped win the BUKC O-Plate race for Warwick, which allows us to use 0 as our race number this year, and drove Warwick's incredibly fast Formula Student car in competition. After setting RBB's quickest time at our test session this month, I'm looking forward to showing some speed and picking up even more in the coming season. The graduate world isn't always what it's cracked up to be. I'm doing a number of things to keep life as interesting as possible, and high on this list is keeping up my motorsport activities. I was at Silverstone with some of the Warwick guys – as reported here by Nathaniel – but even better than that is maintaining my passion for kart racing. As Random Exec Member, then President, then Captain of Warwick Motorsport, I raced in the British Universities Karting Championship a fair number of times. The championship is run using Club 100's fleet of near-identical two-stroke 100cc karts – capable of 70 mph and accelerating from walking pace to 60 mph in around 4 seconds. (There's no 0–60 time because the karts are clutchless: if the driver stops, or spins, the engine will stall and he/she will have to wait to be push-started). Club 100 also runs its own championships, open to the general public. I'm entering one of these this year, the Intermediate Endurance championship, as part of a team called "RBB Economics Racing". The season is made up of 11 races at 7 different national-level outdoor circuits, each race meeting consisting of 40 minutes' practice, 5 minutes' timed qualifying and a two-hour race. Pitstops are necessary every 20 minutes or so (in which time the kart empties its three litre fuel tank). The first round is on the International circuit at Buckmore Park, Kent, this weekend. It won't be RBB's first outing, though: the three members of the team met up at the start of the month to reacquaint ourselves with the karts. The occasion was a BUKC pre-season test day: most of the top university teams were present for the morning session which we took part in. RBB finished a very creditable second overall in the session – a good sign of some real pace. We're very fired up for the race and looking forward to running at or near the front of the field. Expect a post about the team members tomorrow! As you'll all hopefully be aware, especially you Freshers struggling through mountains of university-joining advice, tomorrow is Sports Fair in the Union, 10–4, with entry being free. As general advice, I'd say it's always worth joining a few clubs at the start of the year and seeing which ones are the best, most active and most enjoyable; you can always cut down if & when work starts to get too much. That was the public service reminder; here's the advertising part! I can't recommend highly enough that you join Warwick Motorsport! We have a website (here) which is a little out of date, but the forum is still in constant use. Why should you join? If you've ever wanted to feel some speed and adrenalin from behind the wheel, you can do so with Warwick Motorsport in a safe but very exciting manner. You might just be a fan of motorsports and enjoy watching; whichever way, there are opportunities to get involved. We run karting events indoors and outdoors, both as a club and against other universities; we run trips to watch various events such as F1 testing, BTCC races and the forthcoming D1 drifting exhibition next weekend; we're getting into rallying, through marshalling and possibly even doing some navigational rallies; and of course there are regular socials. We're a large club (150 members last year) and are confident of being even bigger and better this year. Members can, of course, take part in as many or as few activities as they want. Our flagship activity is involvement in the British Universities Karting Championship. We entered 3 teams last year, coming 6th in the championship out of 55 teams from 30 universities, and won a special one-off event which enables us to carry the number 0 on the kart this coming year. The karts are incredibly quick little machines for a first-timer (having two-stroke engines made by TKM), and the standard very varied, with former British national kart champions and F3 and British GT drivers racing alongside beginners. Go and have a look at the promotional video on the BUKC website, it's awesome! Go and have a chat to the guys at Sports Fair tomorrow and let them convince you to join! You are always able to join any club at any time after the Fair, but this is your best opportunity to say hello and see what it's all about.